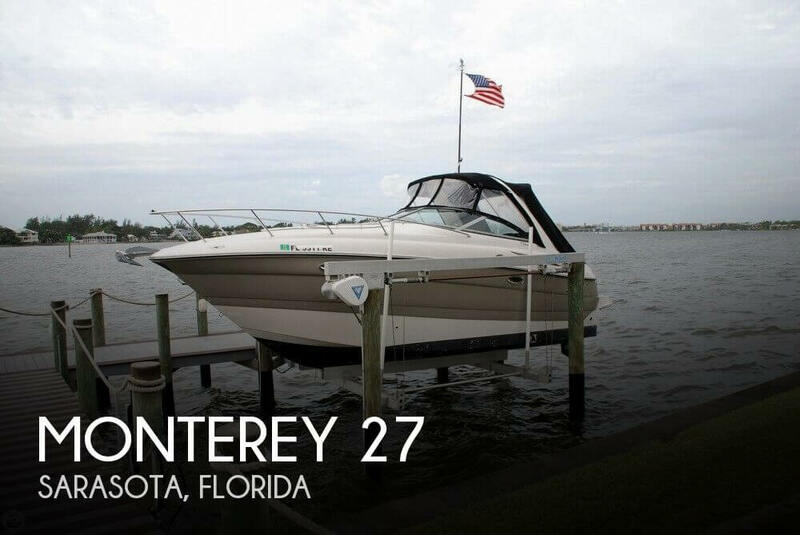 Used 2008 Monterey 270 Sport Cruiser NADA Blue Book Value $64,115-$76,695 SEE PICTURES Engine: Volvo-Penta 5.7L GXI single engine, with dual counter rotating stainless steel props. Props are free of nicks & bends. Skeg & drive in good condition. Engine has 155.4 hours. Our service department has performed maintenance since purchase. Boat has been winterized for the season. Upon purchase we will run engine at our shop and re-winterize. Boat Equipment: This boat comes equipped with a Garmin GPS, Standard Horizon Ship-to-Shore radio, Bennett Trim Tabs, Underwater LED lights, Kenwood upgraded stereo system w/ arch speakers & amp, in-dash depth gauge, Windless anchor system, tilt steering, bimini top with full enclosure canvas, filler cushions for cabin, bow sun pad, dual battery switch, hot water heater, Flat Screen TV, Cockpit Cover, Cockpit Carpet, vacuflush toilet, stove, microwave, fridge, wet bar, 2 bank battery charger, Heat/Air, and Heritage Tandem Trailer with surge brakes. Boat Hull: This boat is yacht certified and has bottom paint. Bottom paint was done in 2013. Hull is in excellent condition. Boat was well driven and docked properly. This is a trailerable boat. We guarantee to the next buyer that everything is in working condition. 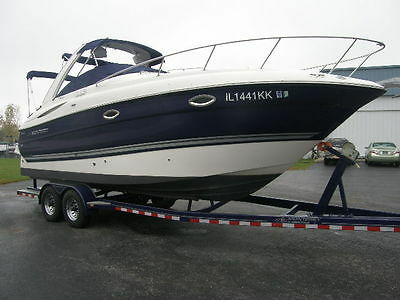 This has been a one owner boat and well maintained. We have title to boat and trailer. We will go through the boat with customer at time of pick-up. This is treated as a private owner sale. Tax and Registration fees may apply. Please, only serious inquiries only. VERY MOTIVATED SELLER Message or call us with any questions. Thank You!